With July 31st round the corner, it’s time for people to start filing their Income Tax Return. However many people, specially those who just started their job, do not know what Income Tax return means and are not aware of the importance of filing it. For the benefit of those, I have come up with this FAQ to educate people about filing Income Tax Return. 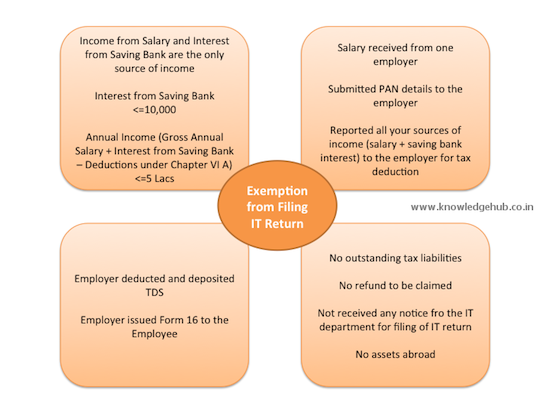 What is meant by “Income Tax Return”? Income Tax Return is nothing but a document that gives the Income Tax department information about taxpayer’s tax liability. It is a declaration by you to the IT department about your income from all the sources (salary, saving bank interest, fd interest etc.) and the tax paid by you on that. However, generally people invest in fixed deposits, mutual funds, shares etc. Such people would not be eligible for exemption. Note that even if someone fulfills the above conditions, they can still file return if they want to. 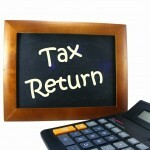 In fact, there are several benefits of filing return, which we’ll see later in this article. TDS: TDS is tax deducted at Source, Generally Employers deduct our taxes in advance and pay to govt in advance. Assessment Year (AY): The year when you pay tax for the income earned in the financial year. FY and AY start in April and end in March. This year we have to file the return for the income earned in 2011-12. So 2011-12 is the FY and 2012-13 is the AY. I don’t earn much so surely IT department can’t catch hold of me if I don’t file my IT return? This is a common misconception that people have. IT department has all the information about your financial transactions, which it gets from banks, credit card issuers, property registration authorities etc. IT department announced earlier this year that nearly 27.5 lac tax payers made cash deposits of over Rs 10L in their bank accounts in 2009-10 and 2010-11. More than 15 lac credit card holders made payments of over Rs 2 L in a year on their credit cards. This should be enough indication that the Big Brother is watching and will catch you sooner or later if you don’t file your IT Return. Income Tax Return statement is needed for Visa processing. Return statement is needed while applying for a loan. 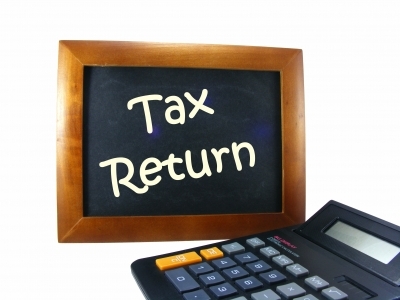 If you paid more tax than was required, you can claim a refund only if you have filed a return. This happens a lot of times. For e.g., if you forget to submit proof of some investment to your employer, your employer would deduct TDS in excess. You can get a refund of that only if you have filed your return. You can carry forward Capital loss or losses from business to next year and get it adjusted against the income only if you have filed your return. On the basis of the tax return filed, refund is paid at an interest of 0.5% per month.with retrospective effect from April 1 of the assessment year for which the return is filed. e.g, Let’s assume you paid Rs 5000/- as tax when you were supposed to pay only Rs. 2000/-. The remaining Rs 3000/- will be refunded to you along with an interest on this amount. The interest will be calculated from 1st Apr of the AY for which the return was filed, till the date refund was issued at the rate of 0.5% per month. 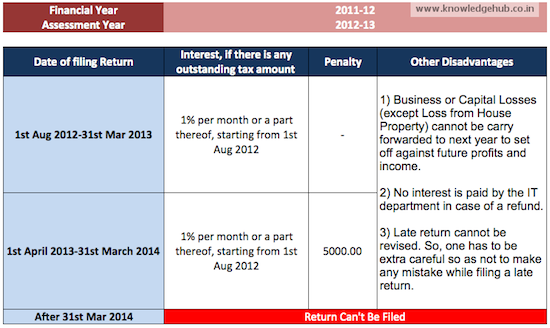 So, if the refund gets issued on 24th Oct 2012, you will get an interest for 7 months (from 1st Apr 2012 to 24th Oct 2012) at 0.5% per month, which comes out to be Rs 105. The gail/loss made by selling an asset or an investment is called capital gain/loss. For e.g., if you bought a share at Rs 100 and sold it for Rs 120, the capital gain on your investment is Rs 20. Don’t fall for this Income Tax Refund Scam!! What is the last date to file Income Tax Return? For individuals, the last date to submit returns is 31st July 2012. I hope you now have a clear understanding of what Income Tax return means. Do you have further questions? Feel free to ask them through the comment form below. Thanks for the info on IT returns. It was very helpful and the best part was that you had kept it simple. I request you to write on different types of inflation and how it is calculated (Core, food, Wholesale price inflation etc). I have written to you earlier regarding the same. Hope you come up with an article on inflation soon. This will help me to document all the article request in one place and will ensure that I don’t miss any. This is the best article i have understood for IT Returns. i have just joined job and today read in newspaper that IT return will be exempted for Salary less than 5 lacs per annum. I didnt get what this statement was until i read your article. nice!